This was a recipe named by me but invented by my ex-husband Jeff, who besides being a gifted gardener and landscaper who can revive even the saddest-looking plants, is also a great cook. This recipe is fast and easy to make, and the sauce can be stored in the refrigerator for up to a week, or in in the freezer for up to 3 weeks. 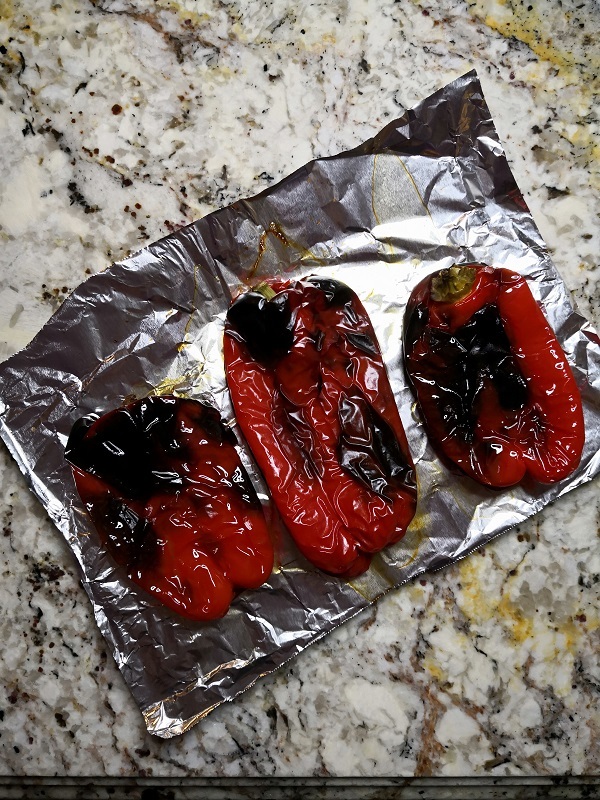 The peppers should be broiled on all sides. It’s ok if the skin turns black, but be sure to check them frequently to make sure they don’t burn. It’s a versatile sauce that can also be used as a marinade. Use it on pasta or over rice, dip slices of bread or chilled shrimp in it, or spread it over bread and sprinkle with cheese, then put in the oven to melt the cheese. It makes a great marinade for chicken or turkey cutlets, too! I find that the texture of the sauce comes out finer, and the flavour a bit richer if you reduce the liquid while cooking, by about a third, and use a mini food processor for the final product.